These areas, which have long been revered and protected by the Haida Nation for their cultural, ecological, and spiritual values have now been recognized by the Province of British Columbia. These new protected areas on Haida Gwaii cover over 256,000 hectares of upland and over 166,000 hectares of marine foreshore and, together with other protected areas, contribute to the permanent protection of over half of the land on the Islands. The Haida Gwaii Management Council (HGMC) is responsible for the approval of protected area management plans for the 17 protected areas within its mandate. The HGMC approval of a management plan creates a requirement that all operational decisions affecting the protected area be consistent with the approved plan. The people of the Haida Nation have occupied and collected food and materials from the Daawuuxusda west coast Heritage Site/Conservancy area since time immemorial. There are seven known Haida villages and seasonal camps within the heritage site/conservancy at Ga Sindas Llnagaay, Kaayjuu Llnagaay, SGaay Taw Llnagaay, Kaysuun Llnagaay, Nadsuu Lngee, Tsaahl and Stlaasiid. The remote location of Daawuuxusda Heritage Site/Conservancy provides an excellent opportunity to maintain biological diversity and natural environment values. Of concern, though is the presence of introduced mammals (e.g., Raccoons, Norway Rats and Black-tailed Deer) which pose a threat to local ecosystems. Sowthistle, an invasive nonnative plant, also occurs here. Daawuuxusda Heritage Site/Conservancy has an important role in providing recreational opportunities such as fishing, wildlife viewing, kayaking and other boat travel, anchorage locations and places suitable for camping and hiking in a remote wilderness setting. Daawuuxusda covers 70,490 hectares of upland and 45,785 hectares of marine foreshore. The people of the Haida Nation have occupied and collected food and materials from Damaxyaa since time immemorial. A seasonal camp known as Kil was originally located at the mouth of Daamaxyah Gandlaay Haans Creek on Kil KaaGan Shingle Bay just to the north of the heritage site/conservancy. Another seasonal camp known as SKiina Llnagaay was located just to the east of the heritage site/conservancy on the shores of Siigaay Hecate Strait. Kil Llnagaay the village of Sandspit is the closest community to Damaxyaa Heritage Site/Conservancy. It borders on the northern and eastern sides of the heritage site/conservancy. Damaxyaa covers 822 hectares of upland and 7 hectares of marine foreshore. Duu Guusd Heritage Site/Conservancy is the only protected area on Haida Gwaii with a significant representation of all of Haida Gwaii’s three terrestrial physiographic ecosections (Windward Queen Charlotte Mountains, Skidegate Plateau and Queen Charlotte Lowlands). Some unusual geological features include Kwaa Skaajuwaas Pillar Rock and Xwaa Beehive Hill. Needan Stlang/Niidan Kaahlii Naden Harbour and Xins Stlang Henslung Cove on Kiis Gwaay Langara Island are the centres for fishing lodge resorts and are popular destinations for guided and non-guided saltwater fishing vacations. The Chahluu Kaahlii Rennell Sound area on the southern end of the heritage site/conservancy is the only west coast area on XaaydaGa Gwaay.yaay IinaGwaay Graham Island that is accessible by vehicle and is a popular area for fishing. Duu Guusd covers 143,539 hectares of upland and 84,173 hectares of marine foreshore. The heritage site/conservancy helps protect an internationally significant intertidal estuarine wetland complex that provides habitat for waterfowl, shorebirds and salmonids and has been used since time immemorial by the people of the Haida Nation for cultural, social and economic purposes. Eleven registered archaeological sites and 77 culturally modified trees have been recorded so far within the heritage site/conservancy. Access to Kamdis Heritage Site/Conservancy is easiest by boat via Masset Sound or Gaw Kaahlii/Gauu Kaahlii Masset Inlet from the communities of Gaaw/Gaauu Llnagaay Masset or Gamadiis Llnagaay Port Clements, but overland access from Highway 16 may be achieved at several locations by short side roads and/ or footpaths. Several private properties are located adjacent to the heritage site/conservancy and landowners typically use boats to access their properties by water via Yahtaahl Kaahlii Kumdis Slough. Kamdis covers 1,896 hectares of upland and 826 hectares of marine foreshore. The people of the Haida Nation have occupied and collected food and materials from Kunxalas since time immemorial. This heritage site/conservancy protects cultural values associated with Kunxalas Cumshewa Peninsula. There are five historic villages or seasonal camps within the area: Lanaaya Llnagaay, Kuntsii Llnagaay, Hlkinul Llnagaay, KuuGahl, and Kunxalas Llnagaay. There is also a regionally significant hiking trail along the coast, easily accessed by road at Gray Bay that connects a variety of beaches. Trails also lead to Sheldens Lagoon (Dogfish Beach has remnants of a dam and a settler’s cabin from 1907) and Cumshewa Head which is a 24 km round trip. A popular frontcountry camping area and day-use site is located at Diinal GawGa Gray Bay, and a smaller one at Kuntsii Sheldens Bay. Other recreational sites of interest include the remains of an old store (1869) at KuuGahl McCoy Cove, the site of a Loran communications tower at Iitllgas Kun Gray Point and a navigational light at King Gwaay Kingui Island. Kunxalas covers 3,360 hectares of upland and 12,358 hectares of marine foreshore. The people of the Haida Nation have occupied and collected food and materials from K‘uuna Gwaay since time immemorial. The Haida maintained villages and seasonal camps at Kuuna Llnagaay, HlGaaydlln Llnagaay, Kaalang.iid Llnagaay, and Sing.gii Llnagaay. Skedans Reserve is surrounded by the heritage site/conservancy. It is a historical trade and potlatching site where the Haida exchanged xaaguu tsiljii dried halibut, sgyuu seaweed, kaaw herring roe, and tluu canoes for taw oolichan grease, dried berries, kyamGaay goat wool, and maat Gaw horns. It is now the site of a Haida Watchmen camp. Environment Canada, The Laskeek Bay Conservation Society (LBCS) and the Research Group on Introduced Species (RGIS) have monitored seabirds, shorebirds, marine mammals, and cavity nesting birds as well as conducted plant inventories on Gwii Gwul Gwaay.yaay Limestone Island and surrounding areas. These studies have documented important ecological baselines, quantified impacts on native species from introduced species, and continues to inform land management through respected academic and civilian science. The remote location of K‘uuna Gwaay Heritage Site/Conservancy provides an excellent opportunity to maintain biological diversity and natural environment values. Of ongoing concern is the presence of introduced mammals. For example, Black-tailed Deer, Squirrels, Norway Rats and Raccoons pose a threat to local ecosystems and species. In addition, several non-native invasive plants have been recorded on Gwii Gwul Gwaay.yaay including Burdock, Bull Thistle, Sowthistle, and Common crupina. 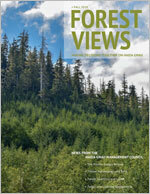 K‘uuna Gwaay covers 2,104 hectares of upland and 13,155 hectares of marine foreshore. The people of the Haida Nation have occupied and collected food and materials from Nang Xaldangaas since time immemorial. Several Haida villages and seasonal camps exist within the heritage site/conservancy at Sguhljuu, Yaan Lngee, Gahldawaa, Kun.gyaalan Lngee, Tuuhlgaa â€˜Lngee, Miiya Lngee, Kanwaas, and Skaaws. There are also two Haida Watchmen camps located on Reserves within this heritage site/conservancy; one at Skaaws George Point and one at Miiya Kun Seven-Mile (Wiah Point). Important foraging habitat and potential nesting habitat and can be found within this heritage site/conservancy for stads kun Northern goshawks, tsallang.nga Marbled murrelets, and Gwaan Common murres. The remote location of Nang Xaldangaas Heritage Site/Conservancy provides an excellent opportunity to maintain biological diversity and natural environment values. Of recent concern is the presence of introduced mammals of which Black-tailed Deer and Raccoons pose a threat to local ecosystems and species. Nang Xaldangaas covers 6,897 hectares of upland and 9,798 hectares of marine foreshore. Access to SGaay Taw Siiwaay K’adjuu Heritage Site/Conservancy is primarily by floatplane, or helicopter, although Forest Service roads on Taaxwii XaaydaGa Gwaay.yaay IinaGwaay Moresby Island are in the vicinity of the heritage site/conservancy, and overland hiking access is possible for those experienced in route finding. SGaay Taw Siiwaay K’adjuu Takakia Lake is relatively small and floatplane access can be difficult for some aircraft under certain loads, but it is the only alpine lake accessible by floatplane outside of Gwaii Haanas National Park Reserve and Haida Heritage Site (where landing floatplanes on lakes is prohibited). Protection of SGaay Taw Siiwaay K’adjuu Heritage Site/Conservancy will help to preserve and maintain the ongoing social and ceremonial use of these cultural features, focusing on protecting harvesting and hunting areas and their associated cultural and biological values. It will provide for present and future Haida access to those areas for social, ceremonial and cultural purposes. 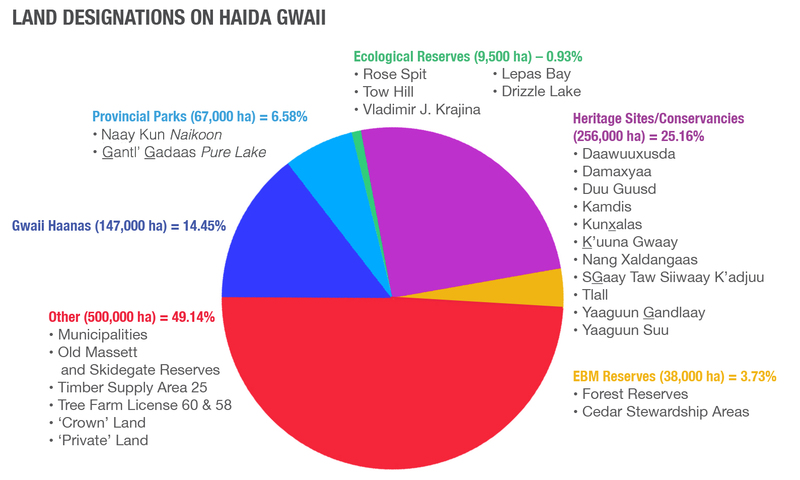 SGaay Taw Siiwaay Kadjuu covers 597 hectares of upland. The people of the Haida Nation have occupied and collected food and materials from Tlall since time immemorial. The Haida maintained villages and seasonal camps at nearby Daaxwa Llnagaay and HlGayxa. The area supports a large variety and number of birds including diila Sandhill crane and Trumpeter Swan. Several listed species also exist within this area including: two known stads kun Northern goshawk nesting areas, one recorded staw Northern saw-whet owl sighting, and tsallang.nga Marbled murrelets nesting habitat. Of recent concern is the presence of introduced mammals of which Black-tailed Deer and Raccoons pose a threat to local ecosystems and species. Several alien invasive plants have also been recorded in the conservancy area including Burdock, Bull thistle, Canada thistle, Sowthistle, and Scotch broom. Tlall covers 16,209 hectares of upland and 22 hectares of marine foreshore. Yaaguun Gandlaay Heritage Site/Conservancy has been used since time immemorial by the people of the Haida Nation for cultural, social and spiritual purposes. The villages and seasonal camps of SGaahldang Kun Lngee, Hlaakiigans Lngee, Yaagun Kun Lngee, and Gandl Skajangs were originally located at the outlet of Yaagun Gandlee/Yaagun Gandlaay Yakoun River and around the shoreline of Yaagun Kaahlii Stlang Yakoun Bay. This area was considered as one of the most important food fish gathering locations on Haida Gwaii. Twenty-five registered archaeological sites exist within the boundaries of the heritage site/conservancy and hundreds of culturally modified trees have been recorded within this area. The heritage site/conservancy’s recommended nearshore marine component is an internationally significant estuary important for migratory and overwintering waterfowl. Additionally, high quality nesting and foraging habitat for stads kun Northern goshawks and suitable nesting habitat for tsallang.nga Marbled murrelets is present. There are two other protected areas in the vicinity of Yaaguun Gandlaay Heritage Site/Conservancy. The southern edge of Kamdis Heritage Site/Conservancy is less than 10 kilometres to the northeast, and Yakoun Suu Heritage Site/Conservancy which protects the headwaters of Yaagun Gandlee/Yaagun Gandlaay the Yakoun River watershed, is located approximately 35 kilometres upstream to the south. Yaaguun Gandlaay covers 2,457 hectares of upland and 232 hectares of marine foreshore. The Yaaguun Suu Heritage Site/Conservancy area has been used since time immemorial by the people of the Haida Nation for cultural, social and spiritual purposes. The freshwater lake and river system has high value for a diversity of salmonids. The presence of intact, old-growth forests provides excellent forage and habitat for stads kun Northern goshawks. The Friends of Yakoun Lake constructed a series of lakeside trails and continue to maintain them as well as conduct other stewardship activities in the vicinity. The Research Group on Invasive Species constructed a fenced exclosure research plot to study the effects of deer browse on the natural ecosystem. Two other larger exclosures also exist that were built by the Haida Forest Guardian program for the study of medicinal plants (ethnobotany). Access to the northern side of Yaaguun Suu Heritage Site/Conservancy is primarily by Forest Service roads either via Gamadiis Llnagaay Port Clements or from Daajing Giids Queen Charlotte. Access to Yaagun Yakoun Lake itself is only possible by foot from a small parking area at the end of a short spur road just north of the heritage site/conservancy. Yaaguun Suu covers 7,970 hectares of upland. There are an additional seven protected areas (two parks and five ecological reserves) on Haida Gwaii that are subject to the protected area authorities of the HGMC. In total, Haida Gwaiis 18 protected areas are comprised of almost 300,000 hectares of upland and almost 170,000 hectares of marine foreshore.